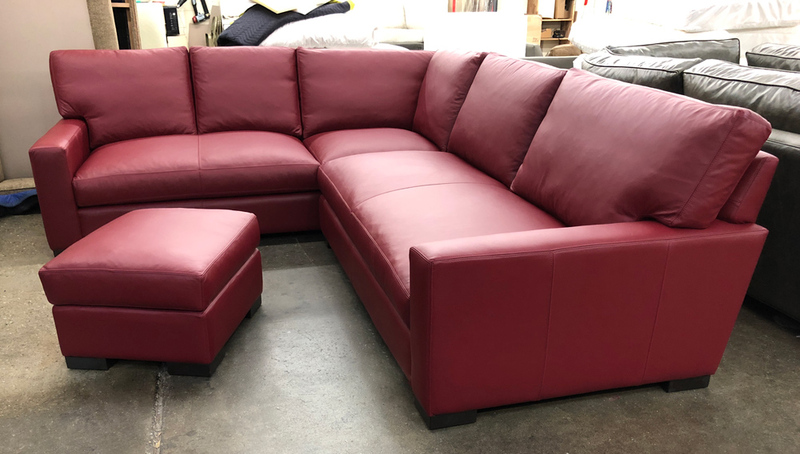 Built for a client of a member of our Designer Program, this is a Braxton Mini L Sectional in the 46″ overall depth, with 10″ added to the “shorter” side of the sectional. 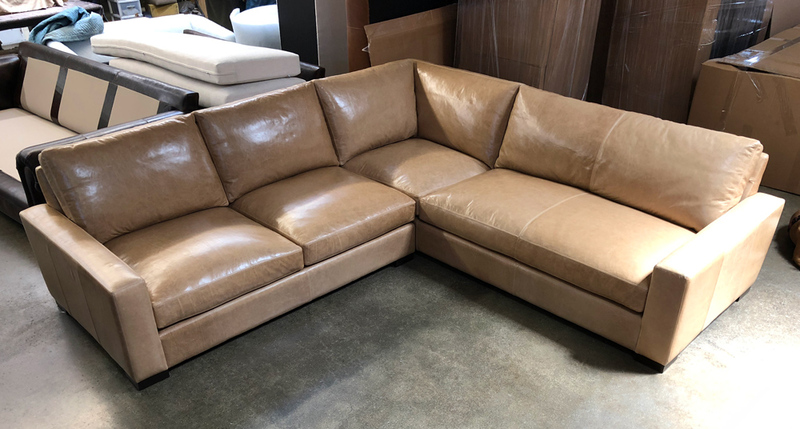 The leather selected was our Glove Buckskin leather, a cousin of the popular Italian Brompton leather, prepared in the same 5th generation Italian tannery. 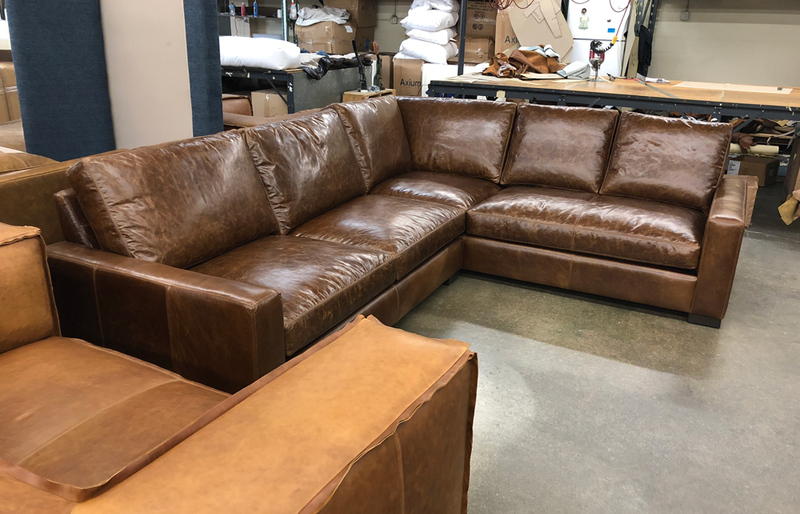 This entry was posted in Braxton, Custom Leather Order Feed and tagged 46" Deep, Bench Cushion, braxton collection, Braxton Mini L Sectional, braxton sectional, Glove Buckskin, Italian Glove Buckskin, Italian Glove Leather, No Ears on August 31, 2018 by LeatherGroups. 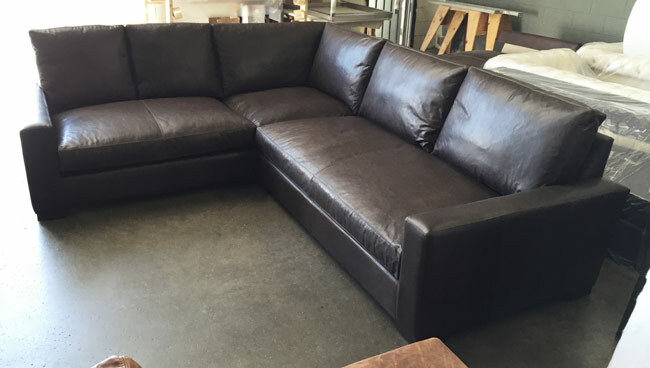 Off to Austin, TX, a Braxton Mini L Sectional in Italian Glove Truffle leather. 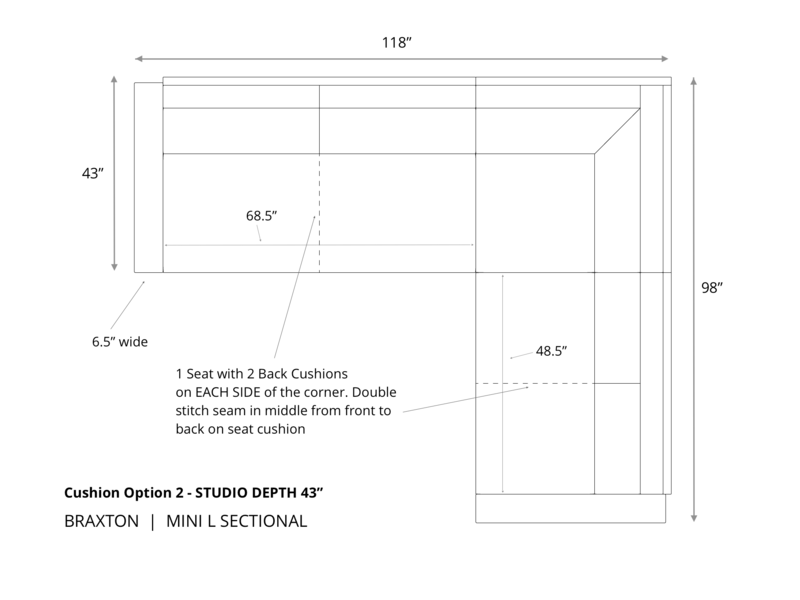 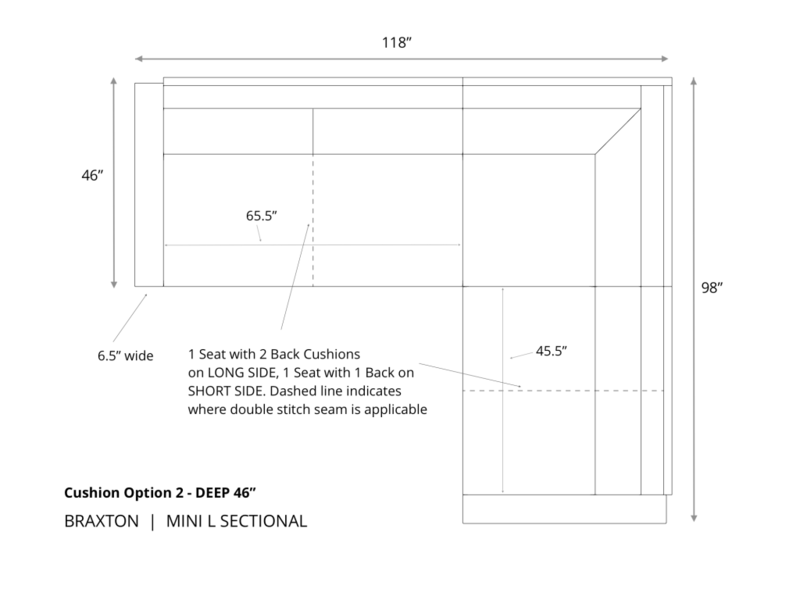 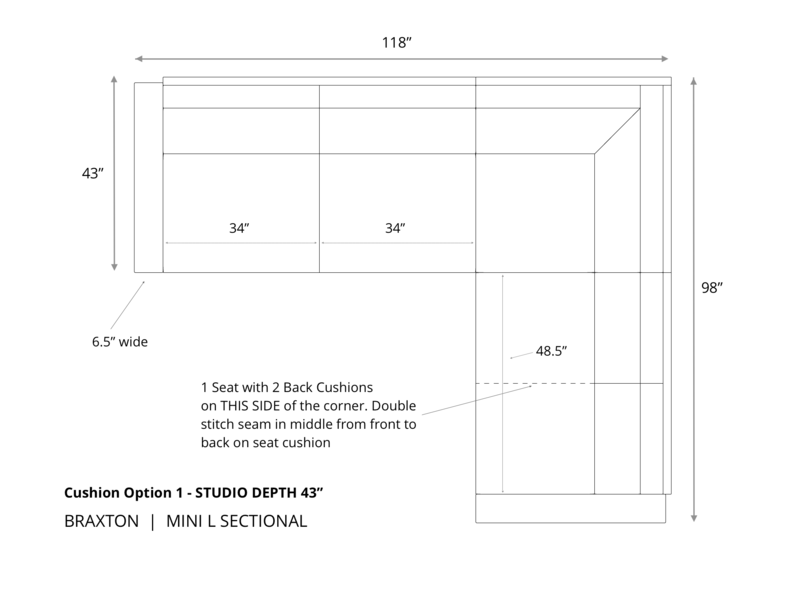 This customer went with Cushion Option 2 (see diagram below) and the 46″ depth option. 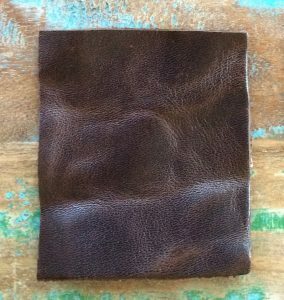 Glove Truffle is Brompton Cocoa’s cousin, made using the same hides, in the same 5th generation Italian tannery. 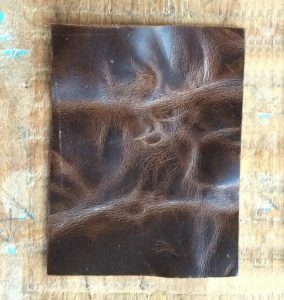 Glove distresses just a bit more subtly than Brompton Cocoa, which displays much more dramatic distressing and color variation with use (see detail images below). 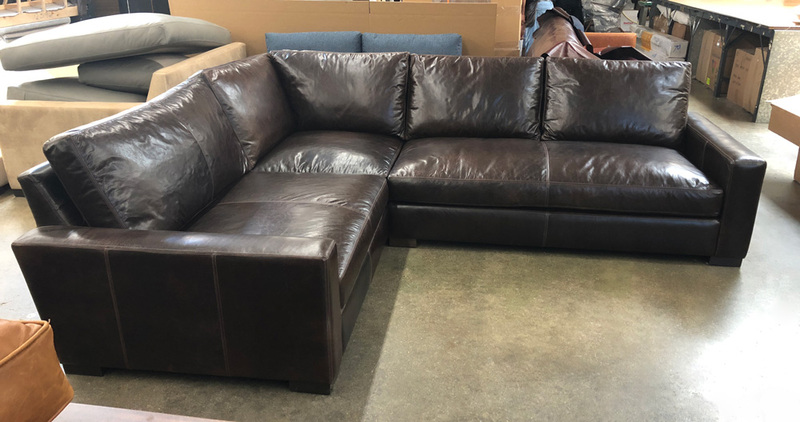 If you’re looking for a good dark brown, and are interested in a Full Grain, Full Aniline Pull-up leather but would like more subtle color distressing, Glove Truffle may be the leather for you. 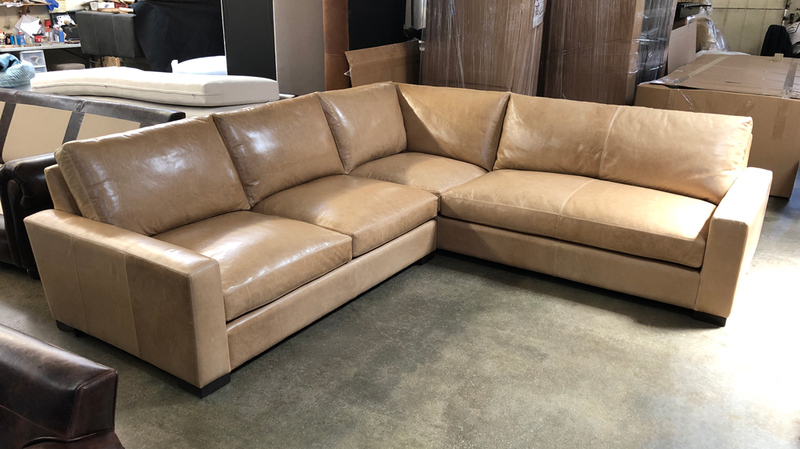 This entry was posted in Braxton, Custom Leather Order Feed and tagged 46" Deep, aniline dyed, Bench Cushion, braxton collection, Braxton Mini L Sectional, braxton sectional, deep, full aniline, full grain leather, Glove Truffle, Italian Glove Leather, Italian Glove Truffle, Leather Sectional, Leather Sectional Sofa, maxwell leather collection, maxwell leather sectional, No Ears, pure aniline on May 9, 2018 by LeatherGroups. 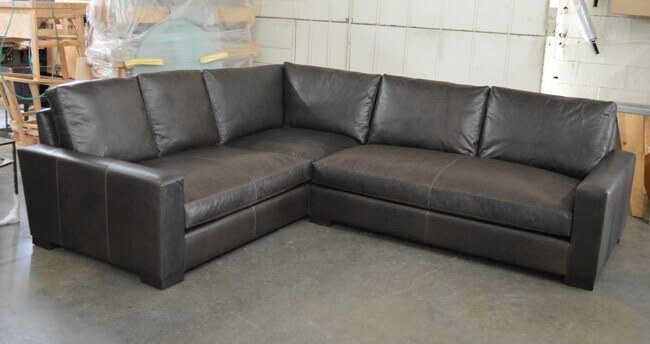 This Braxton Mini Leather L Sectional was just recently shipped out and is on its way to Florida. 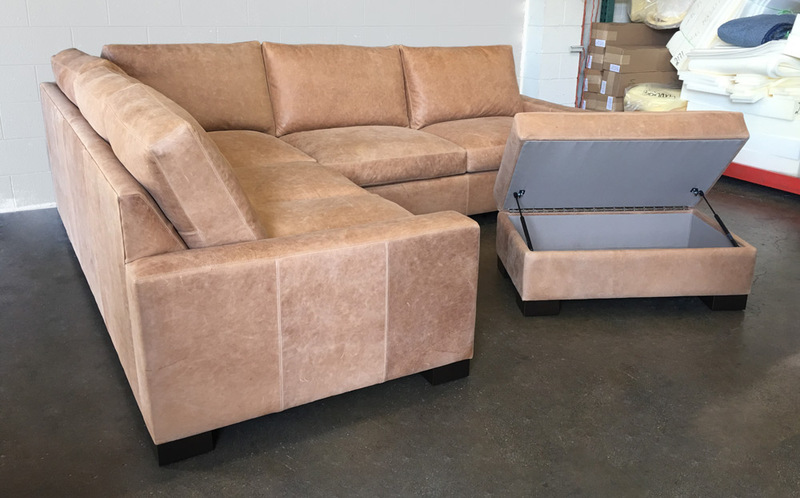 This customer selected Burnham Beige and opted for a matching Storage Cocktail Ottoman. 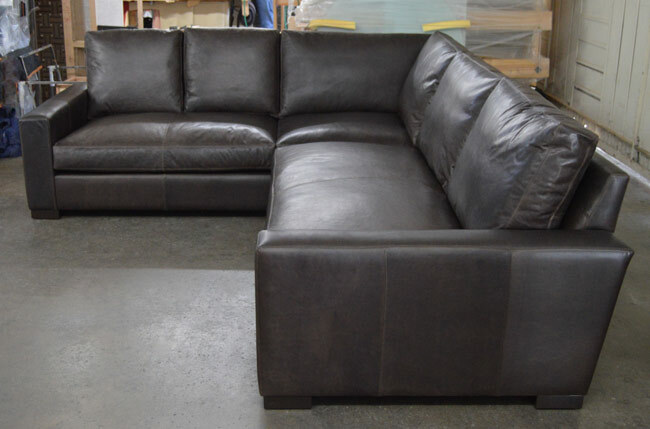 Burnham is an aniline nubuck leather from New Zealand that has been gaining popularity with our customers. 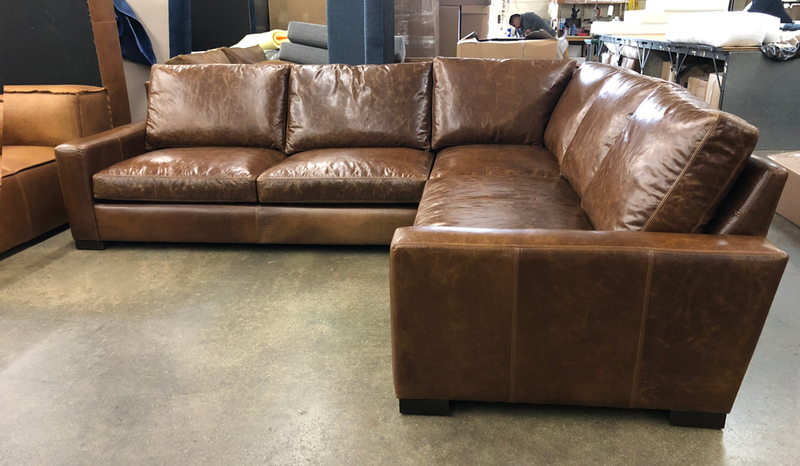 It has a smooth, suede-like velvety hand and is a full aniline leather, meaning that these hides were tumbled in drums full of translucent aniline dyes which soak through the hides. 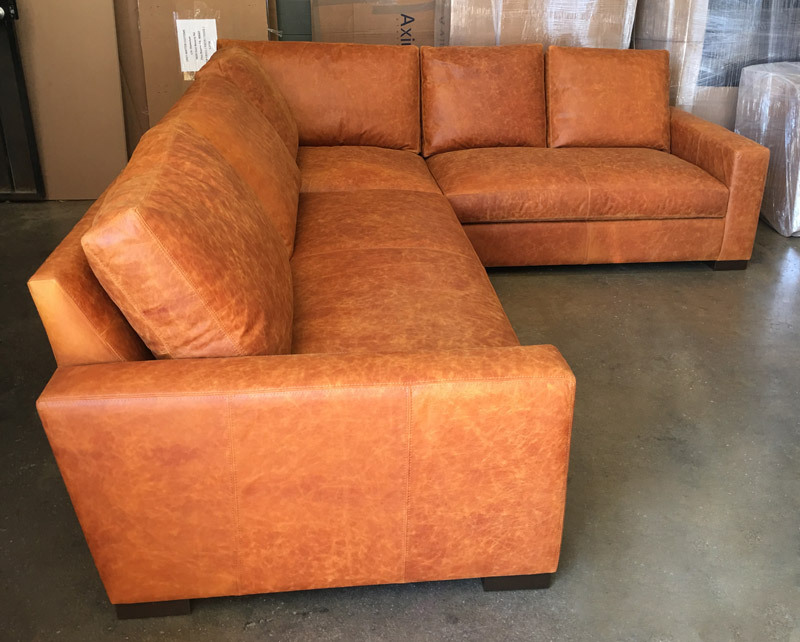 These dyes lend color to the hide, without covering up color variation, markings or any of the natural beauty of the leather. 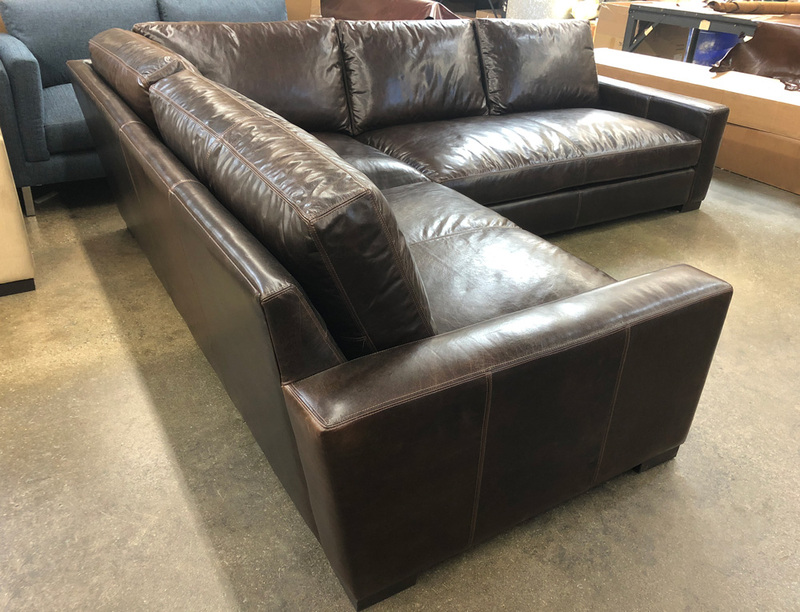 This entry was posted in Braxton, Custom Leather Order Feed and tagged 43" Deep, aniline dyed, aniline nubuck leather, braxton collection, braxton L sectional, Braxton Mini L Sectional, braxton sectional, Burnham Beige, Burnham Leather, full aniline, full grain, full grain leather, Leather Sectional, maxwell leather collection, maxwell leather sectional, No Ears, pure aniline, restoration hardware on August 11, 2017 by LeatherGroups. 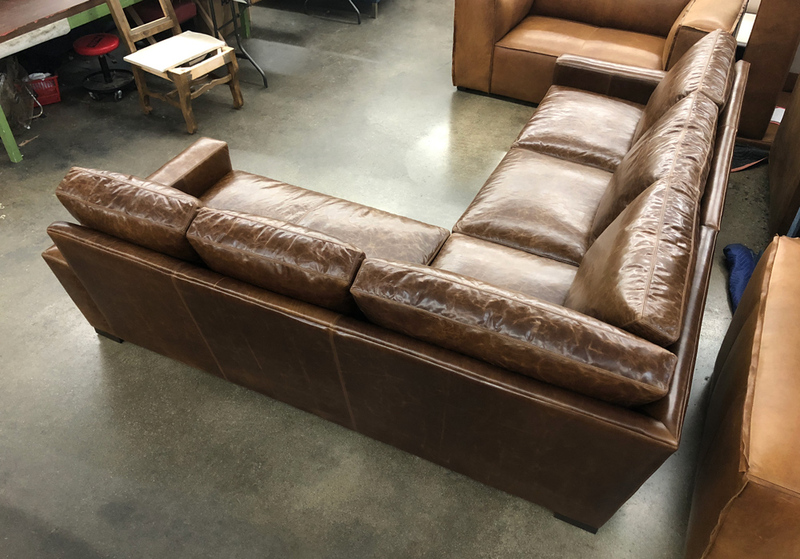 Headed home to Oregon and wrapped in Italian Halter Chaps leather, this Braxton Mini L Sectional packs a lot of comfort into a smaller space. 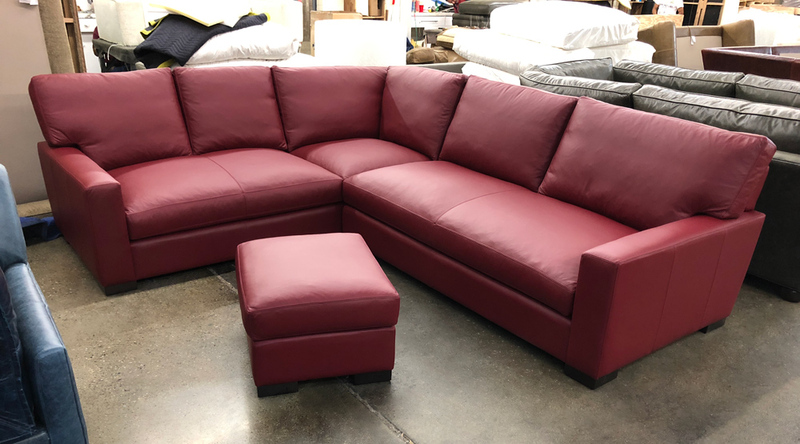 Measuring in at 118″ on the long side, and 98″ on the short side, this version of our popular Braxton Leather Sectional is great when you just need a smaller scale L Sectional. 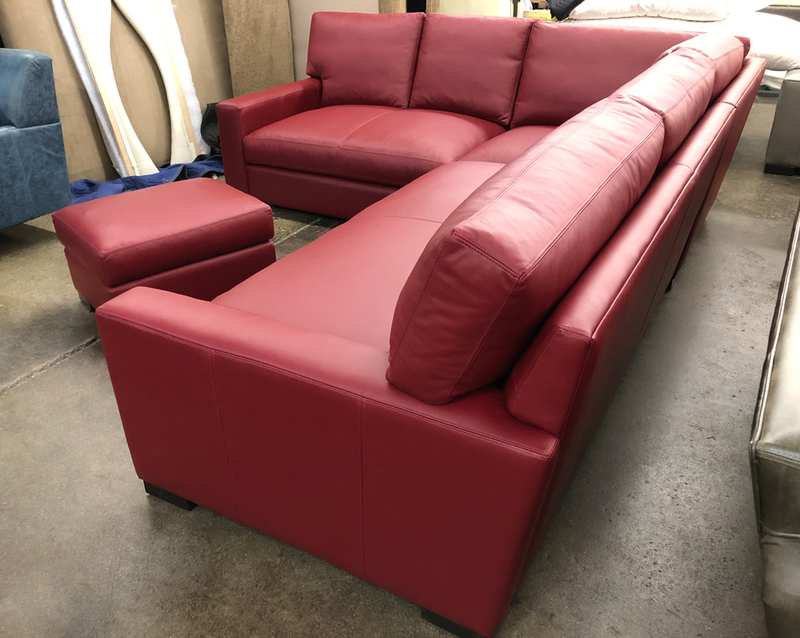 This customer opted for the 43″ depth and “No Ears” on the end back cushions. 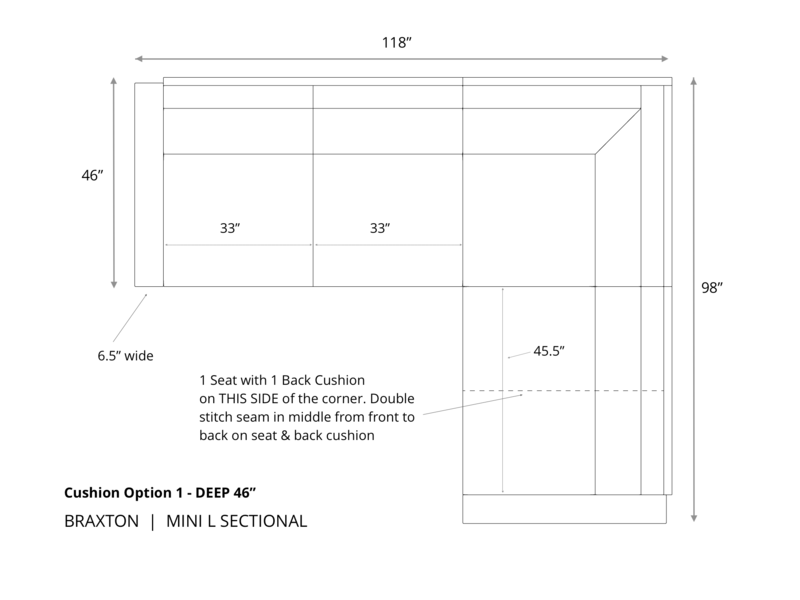 This entry was posted in Braxton, Custom Leather Order Feed and tagged 43" Deep, braxton collection, braxton L sectional, Braxton Mini L Sectional, braxton sectional, Halter Chaps, Italian Halter Leather, maxwell leather collection, Maxwell Leather L Sectional, maxwell leather sectional, No Ears on December 1, 2016 by LeatherGroups. 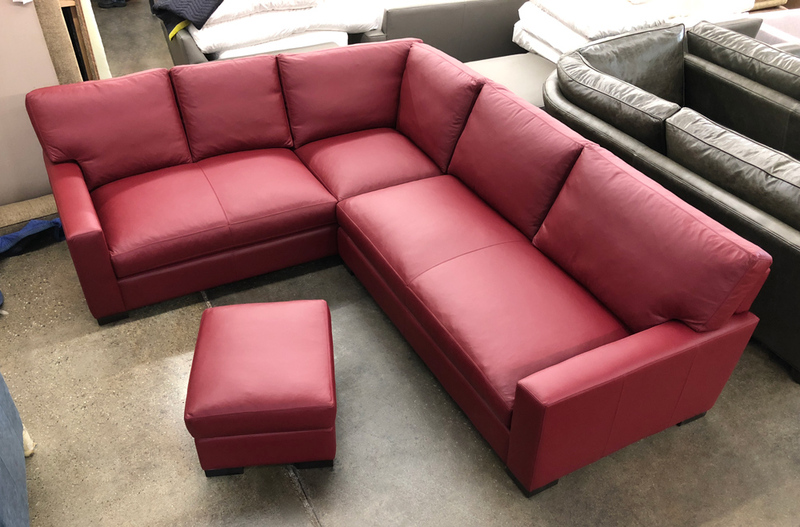 We’ve made so many scaled down versions of our popular Braxton Sectional Sofas recently that we knew it was time to launch a “Mini” version of our Braxton L Sectional Sofa. 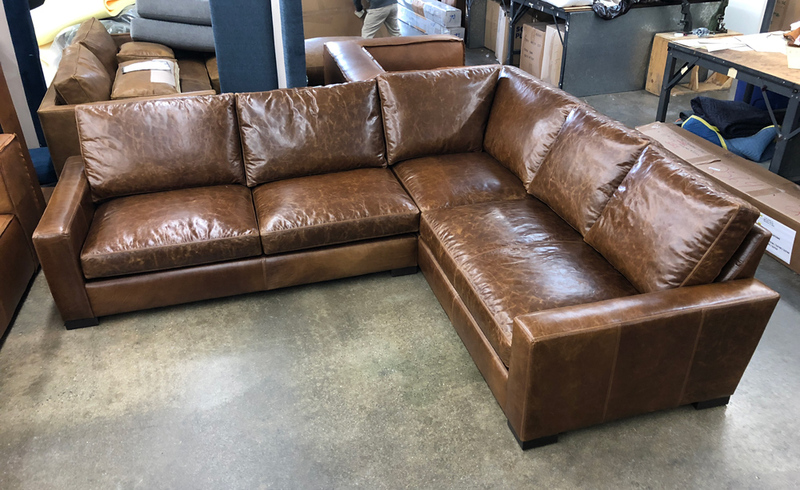 This one was made in the Anthracite color of our Italian Berkshire Leather and is currently taking good care of a great customer up in Seattle Washington. 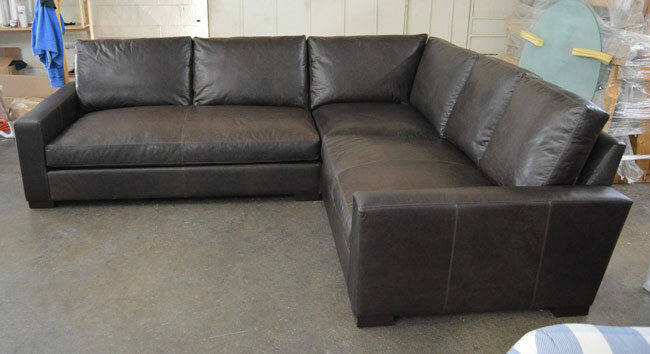 This entry was posted in Braxton, Custom Leather Order Feed and tagged 46" Deep, Bench Cushion, Berkshire Anthracite, braxton collection, braxton L sectional, Braxton Mini L Sectional, braxton sectional, Italian Berkshire Anthracite, Italian Berkshire Leather, maxwell leather collection, Maxwell Leather L Sectional, maxwell leather sectional, No Ears on June 7, 2016 by LeatherGroups.